Venkatesh, a 58-year-old Dalit, has not come to terms with freedom. The 15-kg iron chain that clung to his ankles for two years is gone and his lean frame has suddenly become unbearably light. "It is a strange feeling. It is like coming out of water," he laughs, showing his tobacco-stained teeth. His walk is measured and cautious; curiously similar to an infant taking its first steps. One day he asked his employer for a loan. Puttaswamy Gowda, the driver-turned-quarry owner, who was once a Janata Dal corporator in Mysore, readily lent him Rs 4,250. Two years later Venkatesh told the quarry's foreman Muniyappa that he had repaid the loan with interest and that he wanted to move to another quarry as the pay was too low at Gowda's quarry. Gowda's goons thrashed him the following day, saying he still owed money to Gowda. "I had repaid more than Rs 10,500. But he said I still owed him more than Rs 7,000," says Venkatesh. They took him in a jeep to a welder in Mysore city 15 km away and chained his legs. The nuts and bolts in the fetters were welded so that he would not be able to remove them. "They chained me not for the money, but because I wanted to leave," says Venkatesh. After Venkatesh, four other Dalits were chainedÑVenkatesh's son Gopal, Venkatachala, Nagaraju and Krishna. They also had owed Gowda sums ranging from Rs 500 to Rs 1,000 and the amounts somehow multiplied in the account booksÑ500 became 5000 simply by adding a zero. "Even the cost of the chain, welding and transport was added to our loans," says Nagaraju, who is from Krishnaraja Sagar. The chained men were kept in a shack away from their families. "My son Gopal has not slept with his wife for two years. How can we explain our pain to others," Venkatesh says with tears in his eyes. The children were also made to work. Many of them were sent to a nearby cement factory. "When our children are here, how can we run away? The owner (that's what the workers call Gowda) knew that," says Gopal's wife, Lakshmi. 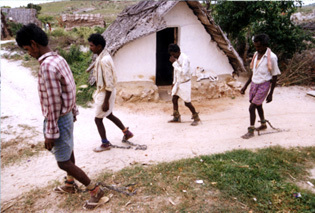 Krishna, Nagaraju, Venkatesh and Venkatachala walk to freedom soon after the Sangha activists barged into the worker's camp at the quarry at Arakere near Srirangapatnam. Whenever a labourer ran away from the quarry, the owner gave the foreman money to find the fugitive. "Their goons would wait at liquor shops in the evening and collect information. When they found the man, they would bundle him into a jeep and take him back to the quarry," says Devraj, a quarry worker. "They want us to work and die here." Krishna was beaten black and blue a week before he got freedom. The offence: he took out one of his dear possessionsÑa pair of trousersÑand wrapped it around his waist. "We could not wear even knickers or underwear because of the chain. I just wrapped the pants to cover myself because I was washing the lungi," says Krishna. Mercifully, his wife and children were not around to see the torture and humiliation. He had sent them away to his mother's house near Mysore, a week after he had started working for Gowda. Ask any woman about life in the quarry, hushed tones and silence prevail. Krishna's relatives Rajamma and Ankamma, however, admit that women were put to unspeakable difficulties. The 23 families (25 men, 30 women and 30 children) at the quarry lived in a perpetual shadow of fear. Even the women and children were beaten up if they spoke against the quarry owner. The goons broke Venkatesh's wife Venkatalakshmamma's hand for abusing one of them. It was, therefore, a minor miracle that activists of the Karnataka Rajya Raitha Sangha could discover the chained men in the quarry during a civic election campaign in June. One Sangha activist, Lokesh, barged into a hut in the quarry to distribute pamphlets, despite resistance from the goons, and found Venkatesh in chains. Venkatesh told Lokesh that he was from Kadathanala village near Pandavapura in Mandya district. "I asked him to tell Nanjunde Gowda about my condition," Venkatesh says. Nanjunde Gowda, a Sangha leader, is popular in these parts. During the rescue operation, Gowda's son Arun Kumar threatened to blast the activists with dynamite. A minor skirmish ensued, and the goons manhandled Nethra Raju, who was video-graphing the event. "We knew that the local police were hand in glove with the quarry owner. He used to bribe them and we could not trust them. So, we called Deputy Superintendent G. Nagappa of Srirangapatnam," says Nanjunde Gowda. Nagappa's response was far from encouraging, says lawyer Murthy. ["I am not prepared to say anything," Nagappa told The Week. "All details will be given in the court."] Even as the police looked on, Arun Kumar called his uncles on his mobile phone asking them to move the remaining labourers and their families to another location. The Sangha activists quickly thwarted the attempt. Nanjunde Gowda believes that the police certainly knew about the existence of bonded labour in Arakere. "When Kamalamma committed suicide last week, the police went there to make an inquest. They must have certainly seen the chained men," he says. Minister of State for Social Welfare Baburao Chavan feels that the police may not have been aware of it. "The chained men were locked up in a room when the police went there," he says. Chavan, however, admits the failure of labour and revenue officials to report the plight of the workers. Even though Mandya is Chief Minister S.M. Krishna's constituency, he did not visit the victims. The man he deputed, Home Minister Mallikarjuna Kharge, did not go to the Nimishamba Temple where they were temporarily put up. Instead, he asked the five chained men to meet him at the inspection bungalow. "Being a Dalit himself, he should have shown some concern," says a Sangha activist. Two days after the labourers were freed from their chained existence, their former 'owner' was sighted again in Mandya: as Puttaswamy Gowda surrendered before the district court, there was a glint of hope that the metal that he had used so cruelly would finally clamp around his wrists.